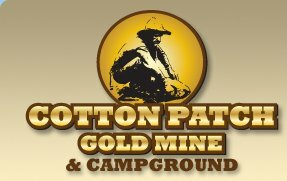 Cotton Patch Gold Mine & Campground would love for you to visit us. We are eager to put your prospecting talents to work. If you would like to speak with us, just drop us a line at: 704-463-5797. Or if you'd like to email us, just click on this link cottonpatchgoldmine@gmail.com. We'd love to hear from you. Click Here to visit Google Maps for more detailed map. 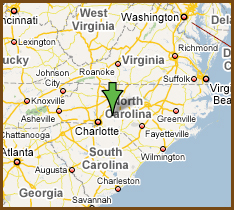 Cotton Patch Gold Mine & Campground is located in Stanly County, in the south central portion of North Carolina in the gentle rolling hills of the ancient Uwharrie Mountain range of the state's Piedmont region. The county seat of Albemarle is 42 miles northeast of Charlotte, 115 miles southwest of Raleigh, 125 miles east of the North Carolina mountains, and less than 200 miles west of the North Carolina coast. It truly can be described as an area of "accessible isolation," near large market areas, yet not hampered by industrial areas threatening to smother it. There are seven other incorporated communities in the county and several unincorporated communities. The former include Badin, Locust, New London, Norwood, Oakboro, Richfield and Stanfield, while the latter include Aquadale and Misenheimer. The Stanly County Region enjoys a mild climate throughout the year, with an annual mean temperature of 60 degrees and an average yearly rainfall of 48 inches. Click Here to check the local forecast and come prepared for a great time at the Cotton Patch. Take Hwy 740 East from New London, go one mile, turn right on Hearne Road, go one and a half miles then turn left on Gurley Road and go 300 yards, 1st driveway on the left at Cotton Patch Gold Mine Sign.